Ammunition used by suspected al Shabaab assailants killed during an attack is displayed outside Somalia's regional government headquarters in the central city of Baidoa, March 12, 2015. VOA sources in Somalia are reporting that an apparent U.S. drone strike has killed a top official of the militant group al-Shabab. Somali officials and individuals close to al-Shabab told VOA's Somali Service the drone attacked a vehicle late Thursday outside the southwestern town of Bardhere. According to sources in the region, the targeted car belongs to Adan Garaar, a top official in al-Shabab's security service, the Amniyat. Garaar is believed to have links with the gunmen who attacked Kenya's Westgate Mall in 2013, killing more than 60 people. Sources told VOA the vehicle was destroyed in the drone strike. It was not immediately clear whether Garaar was killed. U.S. officials have not yet confirmed the reported strike or death of Garaar. Earlier, al-Shabab claimed responsibility for an attack that targeted a key Somali political leader and left at least eight people dead. 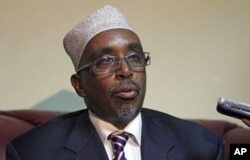 The attack Thursday in the town of Baidoa targeted the official residence and headquarters of Sharif Hassan Sheikh Aden, a former speaker of Somalia's parliament and the current head of Somalia's South Western state. Witnesses said militants detonated a car bomb outside the residence, then opened fire, setting off a gunbattle with guards. Multiple officials in the area said the dead included three attackers, three Somali soldiers and two Ethiopian soldiers with the African Union force in Somalia, AMISOM. Aden is said to be safe and unharmed. Pro-al-Shabab websites reported the group's claim of responsibility soon after the attack was over. The assault was similar to other recent attacks by the al-Qaida-linked group, which has increasingly targeted government officials. Al-Shabab has claimed responsibility for killing six members of parliament since the start of 2014, and also launched two bomb-and-gun attacks on the presidential palace last year. AMISOM said Thursday the attacks are "desperate attempts by al-Shabab to seek relevance" following military defeats by AMISOM and the Somali National Army. In November Baidoa became the capital of Somalia's newly created South West State and the seat of its president, Aden, a key ally of the country's internationally backed government. Al-Shabab controlled much of Mogadishu from 2007 to 2011 but has been pushed out of Somalia's capital and other major cities by African Union forces. On Wednesday evening one person was killed in a suspected Shebab car bomb attack against a popular hotel in Mogadishu, an attack that came several weeks after the Islamists carried out a suicide raid against another hotel in the city, killing at least 25 people. The group has also carried out a string of revenge attacks in neighboring countries, including the September 2013 attack on the Westgate shopping mall in the Kenyan capital Nairobi that left at least 67 dead. Somalia has been unstable since the collapse of Siad Barre's hardline regime in 1991, and the country's new government is being supported by a 22,000-strong African Union force that includes troops from Burundi, Djibouti, Ethiopia, Kenya and Uganda. VOA's Somali news service contributed to this report. Some material for this report came from Reuters and AFP.